Hello! Welcome to Team Jake and Colton's Fundraising Page! We will be walking in the Walk 4RKids on September 8th, 2018 at Meadowlake Park in Enid, OK. We are walking in honor of individuals with special needs, specifically, my team is walking in honor of Jake Whinery and Colton Nelson. Thank you for visiting my team page and for supporting Team Jake and Colton! All money raised benefits the 4RKids Foundation in Enid, OK. You can learn more about 4RKids at www.4rkids.com. Hello! Welcome to Team Jake and Colton's Fundraising Page! We will be walking in the Walk 4RKids on September 8th, 2018 at Meadowlake Park in Enid, OK. We are walking in honor of individuals with special needs, specifically, my team is walking in honor of Jake Whinery and Colton Nelson. Thank you for visiting my team page and for supporting Team Jake and Colton! 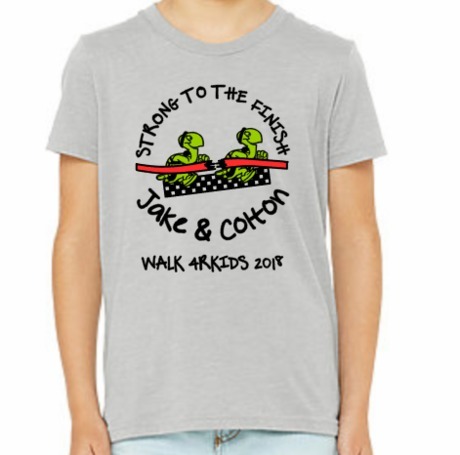 Team Jake and Colton Shirts! $22 for adult, 2x-5x are $25, kids $20. Taking orders through August 15th! Send an email with your sizes to bbwhinery@suddenlink.net. Kevin Frantz33 weeks ago Best wishes. Keith and Sandy Downing34 weeks ago Hi Jake! Sorry we will be out of town again this year. Tell Mom and Dad hi for us! Good luck on your walk and hope to see you all soon! Carla34 weeks ago Best wishes.